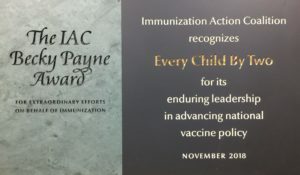 The Immunization Action Coalition (IAC) presented its inaugural IAC Becky Payne Award to Every Child By Two (recently renamed Vaccinate Your Family: The Next Generation of Every Child By Two). Becky Payne was a kind and dedicated woman whose loss was felt by the entire vaccine community. Receiving this award is truly an honor for the organization. Founded as Every Child By Two (ECBT) in 1991 by Former First Lady Rosalyn Carter and Former First Lady of Arkansas Betty Bumpers, the organization has grown into one of the nation’s leading vaccine advocacy organizations. In recent years, ECBT has expanded its mission to promote timely immunization for people of all ages, not limited to children only. As a result, the organization has changed its name to Vaccinate Your Family: The Next Generation of Every Child By Two (VYF). VYF works tirelessly to protect families and individuals from vaccine-preventable diseases. It is particularly effective at using social media to raise awareness of the critical need for timely immunization, increasing the public’s understanding of the benefits of vaccines, and increasing confidence in the safety of vaccines. VYF’s Facebook page has nearly 200,000 followers and its popular Shot of Prevention blog reaches approximately 70,000 monthly visitors. Overall, the organization reaches nearly 11 million people annually with social media messages. “In addition to its extraordinary work in educating the public, VYF is also a leader in guiding national vaccine policy. It is VYF’s strong policy voice that we especially want to recognize with this Award,” said Dr. Deborah Wexler, IAC executive director. Headquartered in Washington DC, VYF educates legislators on current issues surrounding vaccine safety. It also plays a central role in coordinating the efforts of federal, state, and local vaccination advocates working on the shared goal of raising immunization rates for people of all ages. “All of us at Vaccinate Your Family are honored by this selection as the first recipient of the IAC Becky Payne Award. Our Board of Directors, including Co-founder and President Rosalynn Carter, were deeply moved, as our relationship with IAC goes back 20 years and we hold them in the highest regard. We look forward to continuing to work closely on increasing vaccine uptake nationally,” said Amy Pisani, VYF Executive Director. The Award carries a substantial unrestricted financial contribution to support VYF’s ongoing programs. Becky Payne was the first full-time staff member at IAC in 1994 when it received a grant that enabled opening an office and distributing immunization education materials nationally. It is doubtful that without Becky, IAC would be the organization it is today. In 2011, Becky died unexpectedly following surgery. Her competence, professionalism, sense of humor, grace, and tireless dedication to supporting IAC operations, from the time it opened its doors and through the years and days right before her untimely death, were critical to every aspect of IAC’s immunization education and advocacy. 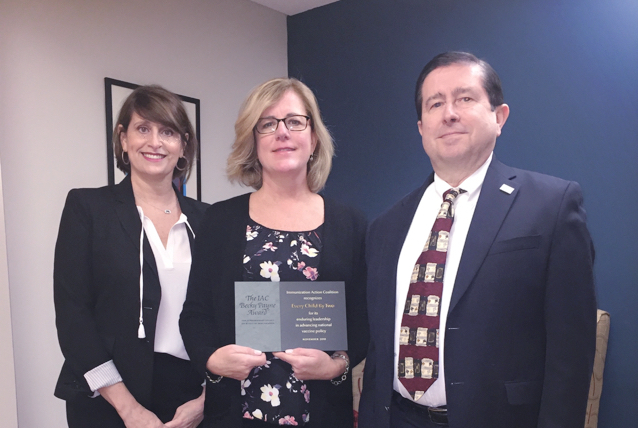 The IAC Becky Payne Award honors Becky’s commitment and service to immunization by providing recognition and financial support to immunization advocates who display initiative and innovation in promoting vaccination. IAC’s goal for granting this award is twofold. We believe it is important for the entire immunization community to be aware of leading organizations and individuals that have and continue to do so much heavy lifting as part of all our efforts directed at raising immunization rates. By highlighting some of these stellar performers, we can spread and deepen the understanding of their critical work. In addition, we seek to provide a meaningful financial boost to the Awardee’s ability to further serve the goals of protecting lives with vaccines. More information about the award is available online at www.immunize.org/becky-payne.